Human anatomy has been essential for better understanding how human body works. By analogy, plant anatomy can be used to better understand how plants work. Check out my graphic and popular science text about wood anatomy in the Fall 2018 issue of Arnoldia (magazine edited by the Arnold Arboretum of Harvard University). The photograph below shows wood microscopic structure with its three major tissues. Their proportions and characteristics vary across different species (see photos below). Since 2016, I’ve been working in the Arnold Arboretum on wood water storage and capacitance in twig wood of 30 angiosperm tree species. Project 1 assessed summer daily capacitance measured in the field. Project 2 assessed capacitance using psychrometers, so I’ll be comparing the two methods. I have measured all tissue fractions (wall and lumen separately) and the amount of contact between vessels and other tissues, creating a quite unique dataset. It is often implied that parenchyma stores water in wood and given that parenchyma fraction varies tremendously across species (~5-90%), I asked: does higher parenchyma fraction provide higher water storage and capacitance? 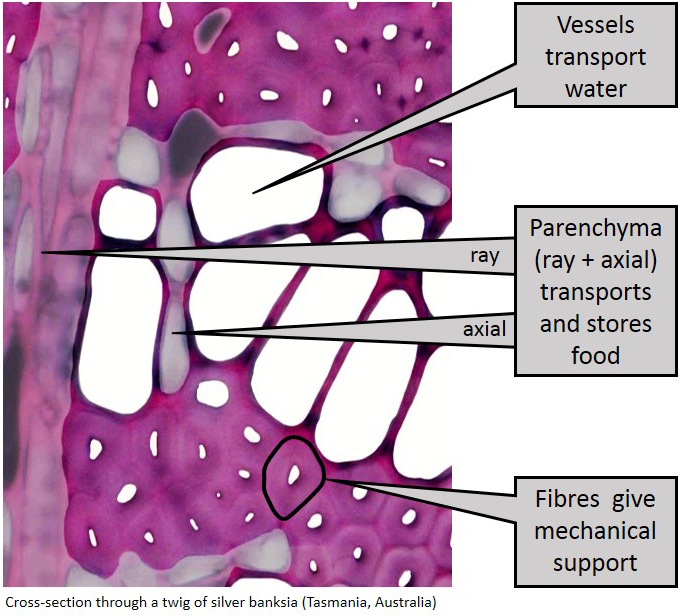 Or are other tissues, for example, fibre lumen, more important for water storage? Project 3 looked at wood mechanical properties in relation to wood anatomical structure: tissue fractions and ray properties (height, width, ray spacing). For this project I’ve been collaborating with Prof. Lorna Gibson from MIT. I am currently writing up the manuscripts. The findings are really interesting so stay tuned! Previous study described major determinants of wood density variation across studied species but it also indicated that the same wood density can be achieved via different anatomies. What are these anatomies? How do they vary across the climates and with other plant traits? How do different anatomies influence plants’ different ways of living? Here is a link to the paper and below is an abstract and an illustration (S3 Figure in a paper). Objectives. Just as people with the same weight can have different body builds, woods with the same wood density can have different anatomies. Here, our aim was to assess the magnitude of anatomical variation within a restricted range of wood density and explore its potential ecological implications. Methods. Twig wood of 69 angiosperm tree and shrub species was analyzed. Species were selected so that wood density varied within a relatively narrow range (0.38–0.62 g cm-3). Anatomical traits quantified included wood tissue fractions (fibres, axial parenchyma, ray parenchyma, vessels, and conduits with maximum lumen diameter below 15 μm), vessel properties, and pith area. To search for potential ecological correlates of anatomical variation the species were sampled across rainfall and temperature contrasts, and several other ecologically-relevant traits were measured (plant height, leaf area to sapwood area ratio, and modulus of elasticity). Results. 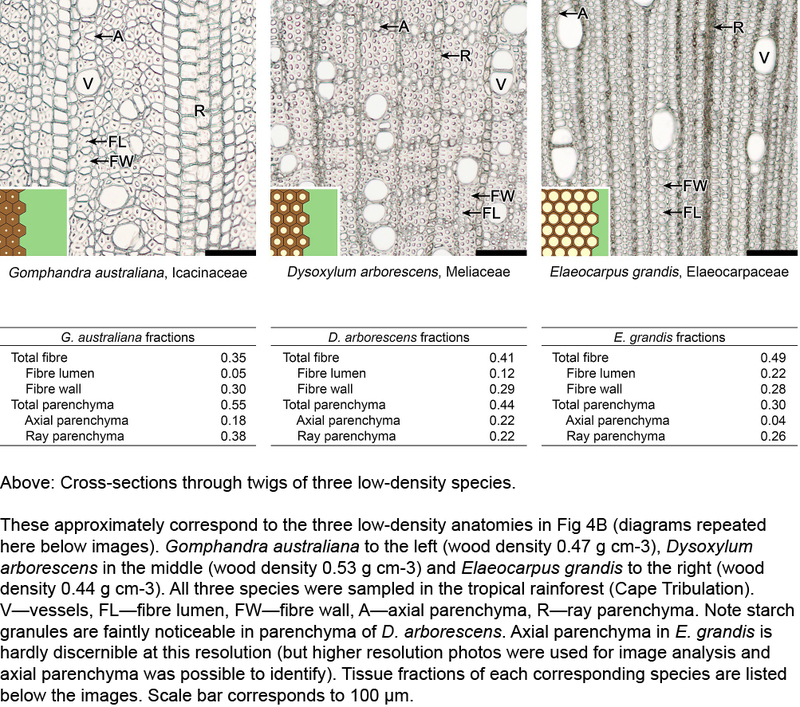 Despite the limited range in wood density, substantial anatomical variation was observed. Total parenchyma fraction varied from 0.12 to 0.66 and fibre fraction from 0.20 to 0.74, and these two traits were strongly inversely correlated (r = -0.86, P < 0.001). Parenchyma was weakly (0.24≤|r|≤ 0.35, P < 0.05) or not associated with vessel properties nor with height, leaf area to sapwood area ratio, and modulus of elasticity (0.24 ≤|r|≤ 0.41, P < 0.05). However, vessel traits were fairly well correlated with height and leaf area to sapwood area ratio (0.47 ≤|r|≤ 0.65, all P< 0.001). Modulus of elasticity was mainly driven by fibre wall plus vessel wall fraction rather than by the parenchyma component. Conclusions. Overall, there seem to be at least three axes of variation in xylem, substantially independent of each other: a wood density spectrum, a fibre-parenchyma spectrum, and a vessel area spectrum. The fibre-parenchyma spectrum does not yet have any clear or convincing ecological interpretation. There are various functional traits being studied by plant scientists. One of the most popular ones is wood density. Density is measured as dry mass divided by wet volume [g cm-3] and it varies considerably from around 0.1 g cm-3 to over 1 g cm-3 worldwide. Despite its popularity the functional role of density is not clear. Therefore, it has become the main focus of my research. To better understand density I have been exploring its anatomical underpinnings. Question: what are the anatomical components of wood density variation across a number of species? I studied 24 species of woody shrubs and trees from east coast of Australia. I measured tissue proportions and wood density on twigs around 5 mm in diameter. Across studied species density was mainly driven by the properties of mechanical tissue: fibre wall and fibre lumen fractions. The two photographs below illustrate high and low-density woods. Fibres are the small, circular/oval/rectangular cells. The low-density wood could be compared to a sponge and the high-density one ­– to a rock. Scale 100 μm. More details in an article here.